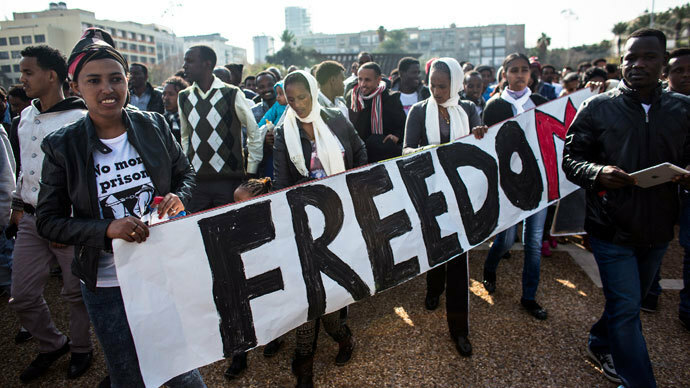 Tens of thousands of Africans took to the streets of Tel Aviv on Sunday in protest of Israel’s detention of their fellow migrants deemed illegal job-seekers by the nation. The rally is the biggest ever held by migrants in the state. 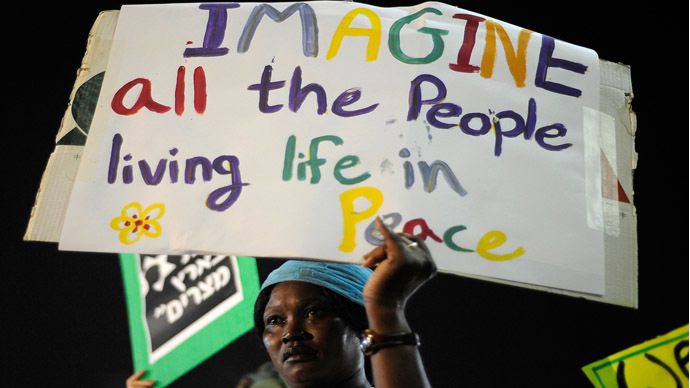 “More than 30,000 demonstrators marched peacefully in Tel Aviv,” police spokeswoman Lubra Samri told AFP. The protesters gathered in the capital’s centre Rabin Square, chanting slogans like: “We are all refugees” and “yes to freedom, no to prison!” A three-day strike was also launched in several Israeli cities. According to police, the protesters are licensed to demonstrate for a period of three days. 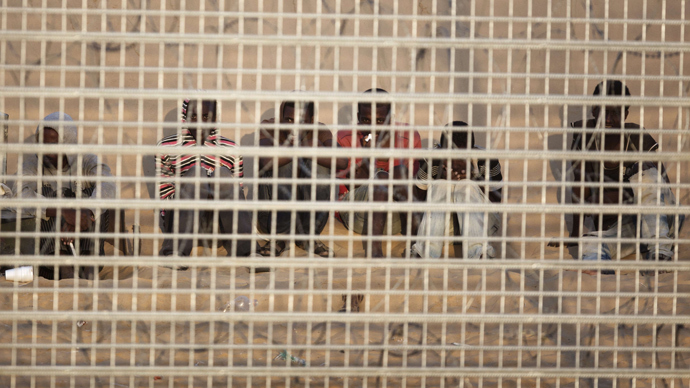 Organizers conducted a leaflet campaign, distributing flyers which read “release all refugees from prison and stop this detention policy,” reported Reuters. According to human rights groups, some 300 people have already been arrested since a new law was passed three weeks ago. The legislation permits authorities to detain any migrant already in Israel without a valid visa indefinitely. 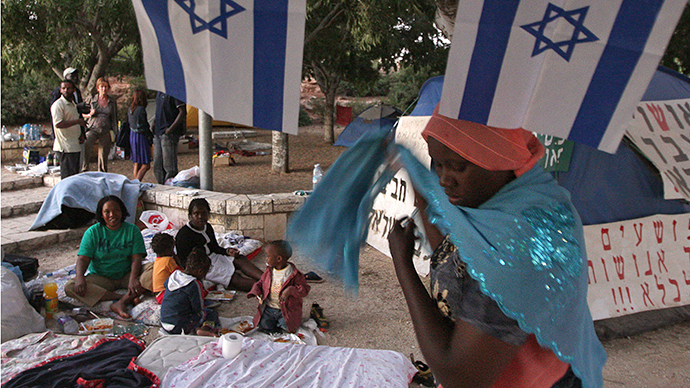 Approximately 60,000 migrants from Eritrea and Sudan, among other nations, have passed into Israel since 2006, according to authorities. A border fence, since constructed, has helped to stem the flow from Egypt. However, those already in Israel still run the risk of being placed in an ‘open prison’ in the country’s southern desert. With the new policy, any migrants who enter Israel since the legislation was passed could be jailed in a standard prison for anything up to a year, while the old policy allowed for migrants to be detained for anything up to three years, dependent upon their status. Israel deems the migrants “infiltrators”, according to hardline orthodox former interior minister, Eli Yishai. He said that their presence was encouraged by “anti-Zionist human rights organizations”. Prime Minister Benjamin Netanyahu has labeled them a threat to the social fabric of the nation. Human rights organizations believe that it would be dangerous for the migrants to be deported back to their home countries as their lives could be at risk. Many are not just migrants but asylum seekers. 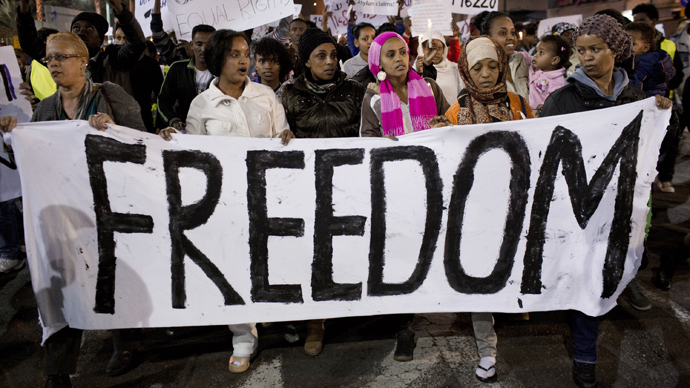 “We have fled persecution, dictatorships, civil wars and genocides,” Dawud, an Eritrean asylum-seeker partaking in the mass demo, told AFP. The NGO ‘Hotline for Migrant Workers’ has accused Israel of pressuring those in jail to accept payouts to leave the country.